We were fascinated when we first saw this beauty at a garden nursery in September, 2013. When told by the nursery helper that it’s excellent for a sunny area and free-flowering all year long once established, we grabbed a pot without hesitation. It helps that we’re residing in tropical Malaysia with its everlasting summers of sunshine and rainfall. It is super conducive for this attractive Arundina graminifolia to flourish easily. Our days of planting epiphytic orchids in pots, such as the Phalaenopsis and Cattleya are over and this marvellous Bamboo Orchid, grown in the ground is a wonderful alternative. 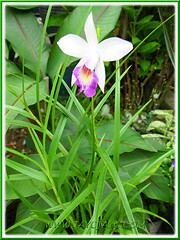 Common Name: Bamboo Orchid, Bird Orchid, Grass-like Leaf Arundina, Kinta Weed. Etymology: The genus name, Arundina is derived from the Greek word Arundo, referring to the plant’s reed-like stems. The species epithet graminifolia comes from the Latin words gramineus and folius, referring to the plant’s grass-like leaves. Origin: Native to Tropical and subtropical Asia from the Himalayas to South-East Asia, including Malaysia, Singapore, Indonesia, Philippines and New Guinea. 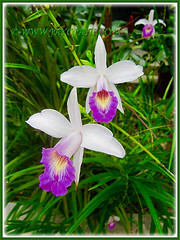 Features: Arundina graminifolia is the one and only accepted species of the genus, Arundina. 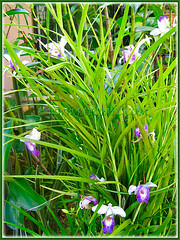 Unlike most orchids, the Bamboo Orchid or Bird Orchid is a terrestrial species that is neither aquatic nor epiphytic. Thus commonly named Bamboo Orchid because it has tall erect stems that look like bamboo and flowers that resemble the blooms of a Cattleya orchid. Sometimes, the erect stems do tip over gracefully. An evergreen perennial with a clumping habit and vigorous growth rate, it can reach up to 2 m tall in the highlands. The garden variety in the lowlands grow to about 70 cm in height. The reed-like stems will be covered with green, grass-like linear leaves that are smooth and simple, with entire foliar margin and arranged alternately along the stems. Leaves measure 10-25 cm long and 1-1.5 cm wide, and tapering to a pointed tip. Flowers are showy and large, 5-8 cm across and adorn at terminal stems. 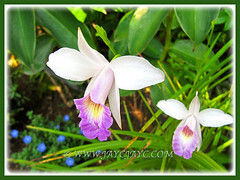 Its three petals and lower lateral petals are white to pink. 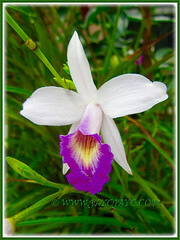 The third petal (labellum) is modified to a bright rosy-purple lip with a central yellow patch. The flowering spikes (20-24 cm long) that sprout from the top of the reed-like canes will produce a cluster of terminal flowers in succession and will show-off one at a time over a prolonged period of time. Its dehiscent fruit is a cigar-shaped capsule that splits to release the minute, wind-dispersed seeds when ripe. Small plantlets or keikis often develop near the end of the stems after flowering and can propagate new plants. 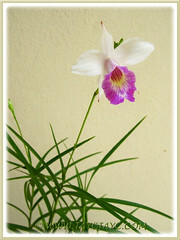 Culture (Care): Arundina graminifolia grows easily with the least maintenance. Light: Full sun and high humidity for optimal growth and flowering. Do provide good air circulation to prevent rot and fungus, as well as produce a healthier plant overall. Moisture: Water generously. Do not allow soil to dry out between waterings. Soil: Grow in moist, well-drained and fertile loamy soils. Adaptable to any garden soil as well. Others: Do prune off withered yellow/brown leaves and spent flowering spikes to maintain tidiness and aesthetically pleasing. Feed once fortnightly and lightly with a balanced organic orchid fertiliser, one that provides healthy growth and flower production. Generally free from serious garden pests. However, poor air circulation will encourage the presence of mealy bugs. For subtropical and temperate regions: Hardiness: USDA Zone 9-11. Arundina graminifolia is a hardy perennial that can withstand mild freezes. If grown indoors, provide sufficient warmth, brightness and humidity. 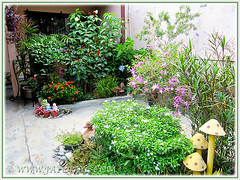 Outdoor plants should be watered well to keep the soil moist, especially in hot summer heat. Blooms in spring, summer and autumn. Propagation: By seed, division of the root mass or aerial plantlet (keikis). Remove the keikis when the roots are a few cm long and pot it separately as a new plant. This plant can even self-seed and self-propagate . Usage: An ornamental plant that’s suitable in a sunny flower bed. Excellent in the front of perennial garden border with taller flowering shrubs behind for colour contrast, as seen in the right image. Ideal in container planting and above-ground planter. In East Malaysia, the flowers of the highland variety are stir-fried and used as food in controlling high blood pressure. Jacqueline! This is one of my favourites too, though Im still a Terete Vanda orchid and their many hybrids nut as they grow so easily with no attention here as well. Just strap them to a tree and spray feed in the rainy season. What really surprises me about Arundina is the sheer variety, all just only two species apparently. Some interesting colours including a completely even darkest violet purple with a deep red throat, a miniature in white and pale lilac, giant pure white, mini white, intermediate dark purple with a bright yellow throat, same with dark violet throat, white with purple trim, purple with white and red throat, white with red throat and all the combinations of the more common white and purple, one pale purple with a dark stripe down the middle of the petal …. endless. I love this one pictured with white and just the inner tube coloured with the throat orange and whitish flare. Some are very tall growing others chest height and others knee height and one truly dwarf which has been reclassified as another Arundina species. In Malaysia you have the highland one and the lowland one, the highland one has a smaller flower the lowland a giant flower etc so it is in other regions as well, altitude and regions within countries have varieties of their own. Some are truly huge a few meters tall with very thick canes, others wispy grass like no higher than your ankles. Besides the colour variations and size of plant and flower, there are also the flower form variations which are incredible. Some are as round as a phalenopsis others big and spidery with narrow petals, others tiny and hooded and hardly open, others exactly like a cattleya orchid etc. My favourite looks just like a flock of white Egrets in flight, its a highland one from Sabba, all white with a deep almost black purple frosting on the edges of the inner tube, only the upper outer petals open fully the lower two jut out straight folded together like legs wings outstretched, another looks just like a white angel, so much so my wife put one on top of our little christmas tree. The leaf of many is different too ranging from bright grass green to dark forest green to pale green, broad, narrow, tough and thick, soft and fluffy, upright or lax etc. Yes ha ha this species excites me a lot as they are so easy and Im sure more species will be divided out of the single broad classification in future, especially the ones from Vietnam, India and Nepal which are so very different in form and colour. I must say though I battle with some aspects of growing these, namely fertiliser and getting them to grow when Im ready not them. Im still experimenting with fertiliser and so far plain wood or leaf ash seems to work the best and the safest. They dont seem to love chemical fertiliser very much and will stall, delay sending up new canes and flowering. Maybe Im wrong but I would love feed back on this issue. I’ve used organic cow manure pellets and the canes grow too well and tend to kink dramatically or zig zag before they are mature so stopped that, the canes also get too long and fall over this way. In the wild they grow on very infertile disturbed earth where the top soil has been removed so maybe they simply dont like too much of anything. Ideally I like a new flush of even flowering canes each wet season (which is now), when the shoot. So I wait until I see the new shoots emerge about four or five inches out the ground then I cut all the last years canes in half. 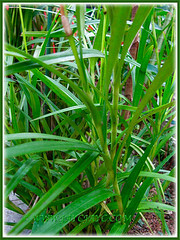 If I cut the canes too soon the emerging shoots stall as I guess the sugars and carbos in the old canes are needed, this is why I also just cut them in half rather than to the ground. To let in light, plus the blackened old flower stems arent very nice anyway. When the new shoots are as long as the reduced canes I take the old canes out completely at the ground and there it is a whole new even plant to flower left. While waiting for the shoots to develop the old reduced canes produce small plantlets called keikis or something or other, these happily flower on the cane while still small in the meantime, so I get a double flush of flowers this way too. When pruning grab all the fallen leaves from between the canes as these also block the annual emerging new flush of canes. If the old canes are very densely packed often the new shoots struggle to emerge because of lack of light. I have this with the small alba (completely white with yellow throat) so with this one I remove completely one third of the old canes at the ground and reduce the strongest canes by half I also take out the thinner weak canes completely. Often the old canes will have already produced keikis and they are flowering but dont let this worry you if you leave them the new even flush of cans will battle to get up and you will end up with quite a messy plant that ultimately tends to fall over. This is great news if you are a wild plant as the little keikis can then root in the ground but its not so attractive in a border in the garden. Generally you will have a sprinkle of flowers all the time and one big whoosh from a month into the rainy season until next year when you start all over again, flowering is slightly reduced in the dry season depending on the humidity. When these plants get the same attention from breeders as other orchids Im sure we will see some spectacular ones appearing. Already some coming out of Thailand are very interesting. These have been cloned from cells inVitro and some interesting variations are appearing as a result. There is also a hybrid between the species the dwarf and the intermediate sized one. Next week Im off to Chatuchak market in Bangkok where Im sure I will find another interesting form to bring home, they also seem to collect these far and wide but primarily in SEA. Hi Anton. I enjoyed reading your lengthy message above, so much to digest that make my mouth gawked in wonder at your awesome experiences and botany knowledge. Truly remarkable… never knew there are so many marvellous variations of the Bamboo Orchid.